This entry was posted in Chat Codes and tagged animated, app, chat, chrome, code, codes, emoticons, extension, facebook, firefox, gif, google, google chrome, greasemonkey, ipad, iphone, ipod, Josh Bitossi, Kirill, Le Boss, pink, ramos, revo, sellami, Shulman, small, smiley, smileys, smileyti.me, source, sourcecode, taher, Taher Sellami, techez, turboelgo, turbolego, turbolego.com/L.txt, You Mad, youtube. Bookmark the permalink. 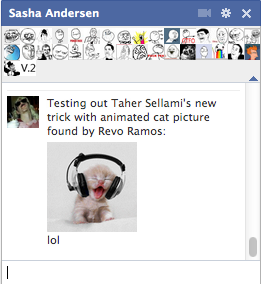 6 Responses to Animated pictures in the Facebook Chat! ikr, btw, CMC thanks for these..
tem como voce ensina como posta imagem GIF para o meu album da minha pagina ?